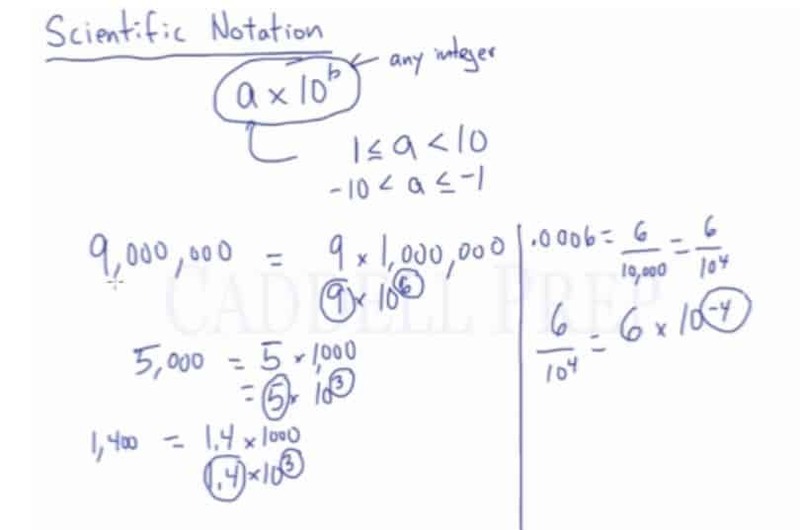 In this lesson, you will learn how to write numbers in scientific notation. Whereas can be any integer and can be positive or negative. See , , and are our . All of them meet the requirement above. Likewise, all the exponents are integers. Here’s an example of a negative exponent. To review our lesson in Exponents, we have to change the sign to move the denominator to the numerator. This is a bit tedious work. Don’t worry. There’s a quicker way to do this! Then let’s count the decimal spaces from the right of and stop to get . This goes right in as our exponent. Remember, we need to have a number that is less than so we can’t have . There are decimal spaces. This goes right in as our exponent. We counted from the right to left. Meaning it’s a big number and we’re making it small. Now, let’s have a small number. Let’s get a number between and . Then let’s count the decimal spaces to have the value of our exponent. But remember we counted from left to right. Which means it’s a small number and we’re making it big number. We have to counteract that by making the value of our exponent negative. Exponent should be in negative if we have a small number and we’re writing it to appear a big number. On the other hand, an exponent is positive if our original number is big and we’re writing it to become a small number. Let’s have one more example. Our exponent is since we moved three decimal spaces to get . Moreover, it should be in negative because we have a small number. If you moved the decimal to the left, you’ll have a positive exponent. And if you moved the decimal to the right, you’ll have a negative exponent.